RayLab 2.22 has just been released in the App store. The main new feature in this release is Ray Transfer Matrix (ABCD) analysis. I am quite excited about this feature. 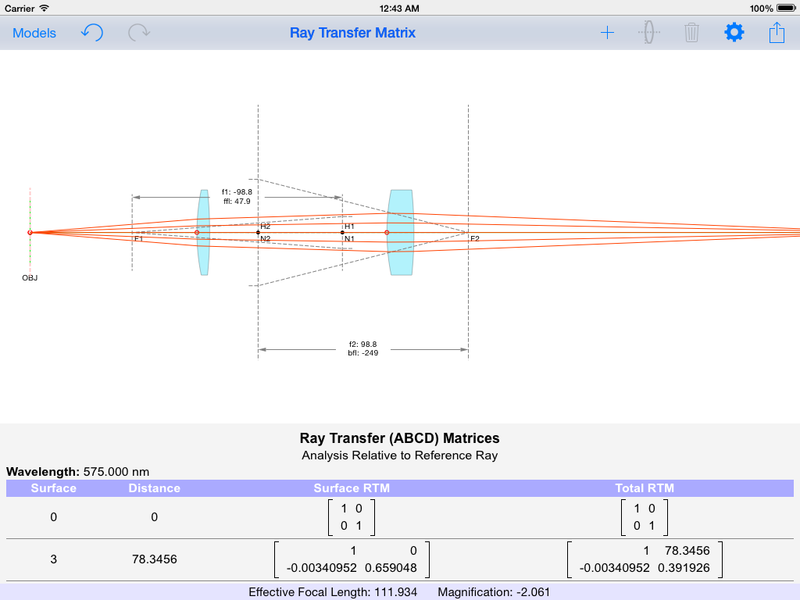 In addition to the basic Ray Transfer Matrix which is described in most introductory treatments of the subject, RayLab can perform some more sophisticated RTM calculations allowing it to be used with non axial optical systems. It took some time to work out and implement the more general techniques. Thanks to professor Lee Townsend for pointing out some very useful references on the subject. More details on RayLab’s Ray Transfer Matrix analysis here. Edit: The Pro in-App purchase did not show up in 2.10. This bug is fixed in 2.11. RayLab 2.10 is part of transition to new pricing plan for RayLab. The intention is to make the RayLab app itself free. This will give access to many of RayLab’s features. But certain features are now part of the Pro in-App purchase. The Pro package is currently free, to give an opportunity to all current users to enable it at no cost. After a few weeks I will make the main App free, and switch the Pro in-App purchase to a paid item. More info here on Analysis Windows. If you try to use any of the Advanced Optics, or Analysis Windows, you will be prompted to purchase the Pro upgrade (Which is free during the transition period). Once you enable this you will have access to all Pro features even after the free period ends. Only new users would need to pay for the upgrade at that point. If you have purchased any glass catalogs, you will continue to be able to use those regardless. The ray intersection algorithm has been improved to be much more accurate in the case of oblique rays and high curvature elements. RayLab is my first iPad app appearing in the App Store. I plan on adding many more features. If you have suggestions about what capabilities will be most useful, post a comment here.